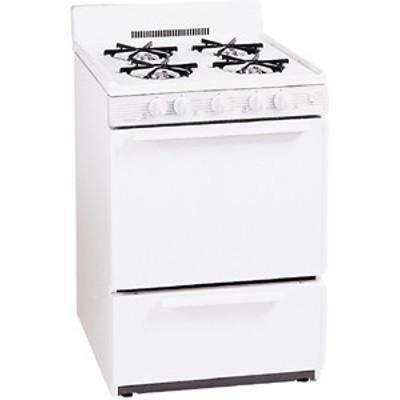 Premier offers a 24" white freestanding gas range with a 2.97 cu. ft. capacity and gas pilot ignition. The appliance features a 4" porcelain backguard, front controls and four burners. This range also provides two oven racks, a roll-out drop door broiler drawer and an anti-tip bracket. An easy access, roll out drop door broiler. Eliminate the need to reach over hot burners, making this range ADA compliant. All open burner models allow easy conversion from Natural to L.P. gas without additional parts or special tools. Additional Dimensions • Oven width: 19"
• Lifetime warranty on top burners.